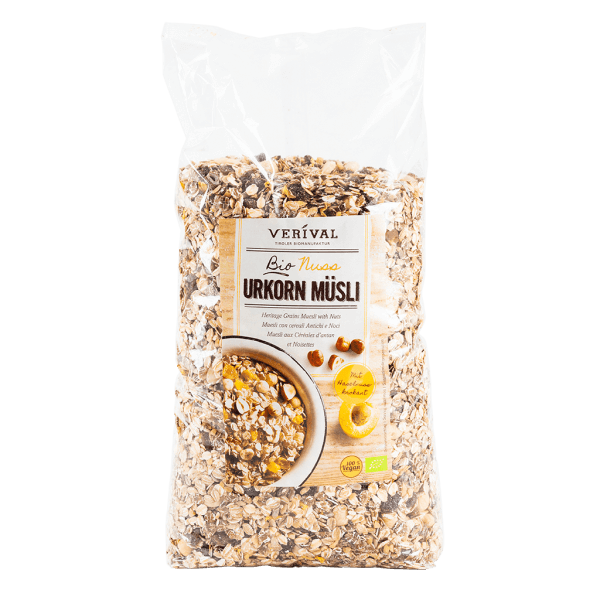 Flaked wholegrain oats and rye and Verival wheat from our contract growers with a blend of crunchy hazelnuts, almonds, sunflower seeds and sweet, juicy sultanas and apricots. Finished off with hazelnut brittle and sunflower petals. Deliciously chewy and 100% organic. Good morning! Wheat flakes*, oat flakes*, rye flakes*, sultanas* (sultanas* 99,5%, sunflower oil*), hazelnuts brittle* 8% (hazelnuts kernels* 73%, sugar*, caramel*), roasted hazelnuts* 4%, apricots* (apricots* 97%, rice flour*), sesame seeds*, sunflower seeds*, almonds* 3%, sunflower blossoms*. > May contain traces of lupines, soy ans other nuts. Cold: Best enjoyed with fresh fruit, milk, yoghurt or quark. Hot: Bring milk or water to the boil, stir in muesli, remove from heat and let stand for 10 minutes before eating.